The 5 assignments in this course comprise 40% of the grade, and are designed to acquaint students with the emerging Transition Design approach for addressing complex, wicked problems and seeding/catalyzing systems-level change and cover the following topics: 1a) Mapping Wicked Problems; 1b) Mapping Stakeholder Relations; 2) Multi-Level Perspective Mapping (MLP); 3) Developing Future Visions; 4) The Spatio-Temporal Matrix; 5) Designing Interventions. These assignments will be undertaken by small teams working on one of the wicked problems below, for the duration of the semester. Final assignments submitted in the form of team Medium posts and final project canvases should be submitted to the design office the same week. Members of teams will evaluate each other upon their ability to collaborate successfully throughout the process. The class cohort will be divided into small teams and at the beginning of the semester, each team will select a different wicked problem on which to conduct research and base the 5 assignments. These assignments are intended to introduce the concepts and objectives of each aspect of the Transition Design approach. Teams will be supplied with large ‘project canvases’ for each assignment, which form the basis for brainstorms conducted with post-it notes and upon which the final work should be completed. Most assignments will be introduced in-class, but will require teams to do work outside class in order to complete the assignment. (Comprehensive instructions for each assignment can be found on the corresponding tabs in this section of the website). Completed project canvases should be photographed/documented and should be supplemented with a written analysis and conclusions. Additional visuals in either analog or digital form may be created to further clarify the process and results. Some assignments will be presented in class critiques however the final submission of all assignments should be in the form of a post on each team’s Medium site (one site which contains all 6 assignments). We recommend teams review Pittsburgh’s Resiliency Strategy Report to gain an overview of the city and its challenges. All 5 course assignments should be submitted as annotated Medium posts on a single Medium site that the team creates. You’d be surprised at how often teams forget to label their post with the name of their wicked problems and all of the team members names. This is important! Each team will begin their initial work brainstorming with post-it notes on an analog ‘project canvas’ that will be provided by the instructors (and that can be downloaded on the assignment pages of the website). Initial work will begin in class but should continue outside class. Teams should photograph/document each stage of the evolving process for the final Medium posts. Teams should complete the assignment on the project canvas (analog form), then photograph it in high resolution as a PDF/PNG and making necessary adjustments in photoshop to ensure legibility on the Medium site. Each submission should contain clear, easy to understand visuals of the work accompanied by a written description of the process along with analysis, insights and conclusions. Collectively the assignments amount to 40% and these will be evaluated based upon in-class presentations (where applicable) and the final documentation on the Medium site. Both visual and verbal components should be of a high standard; work will be graded down for poor writing quality, unclear/low-resolution visuals or text and lack of overall coherence. Each site should begin with a title of the wicked problem, all team members’ names and an introductory statement about the problem and high-level issues/consequences. Write it as if it was meant to communicate the problem to the Mayor and City council. NOTE: When placing photos in Medium make sure they are hi-resolution, clear, and in focus. You might choose to provide the option to click on photos to view them at a larger size. If we can’t read them, we can’t assess them. At the end of each assignment, teams should also turn in the final project canvases to the Design Office. It is imperative that you begin researching your wicked problem immediately. Each team will select one of the 15 wicked problems listed above to focus on for the entire semester. All 5 assignments will be based upon gaining a better understanding of how the problem arose, became wicked over a long period of time, and how it currently manifests (affects people and society) at all levels of scale. In order to complete these assignments, teams should begin immediately to conduct research on the problem. We recommend creating a shared Evernote team folder (or another collaborative platform that accepts multiple formats) which will enable team members to conduct research and archive it simultaneously. Look for books, newspaper articles, reports, interviews and websites that discusses the wicked problem, related issues and its consequences. Be continually adding notes, analysis, insights etc. to the research archive throughout the semester. The list of 15 wicked problems is common to most cities, therefore research on how a particular problem manifests in other locales can also prove informative for your research and assignments, particularly when it pertains to how other cities/communities have attempted to resolve the problem. It is important that the research process is ongoing and that the team’s understanding of the problem deepens as the semester progresses and that the learning from one assignment, informs the ones that follow. The 5 assignments correspond to class topics and discussion throughout the semester; two assignments fall at the beginning and end of the semester, with two others falling in the middle. The month of February is relatively free of assignments, but we recommend using this time to conduct research that will prepare you for the following assignments. Achieving a passing grade for the assignments will, in part, rely upon the amount and quality of the research your team conducts. Read through all of the assignments at the beginning of the semester as they will guide your research process. Completing the assignments successfully will depend upon good team collaboration. Because wicked problem are inherently transdisciplinary, they can only be addressed through radical collaboration. The team sorting exercise at the beginning of the semester aims to create as much diversity as possible within teams. Although it is often more ‘comfortable’ to form a team with people from a similar discipline who are friends or acquaintances, in group work such as this, it is not an advantage. The higher degree of diversity within a team the better. Ideally teams would be comprised of people from different disciplines, representing different belief systems and cultures and different perspectives based upon life experience and gender. Wicked problems are comprised of stakeholders with differing opinions, beliefs and agendas and having this kind of diversity present in a group is a potential advantage. However, this diversity can only be leveraged as an advantage if the team learns to collaborate well. The mindset and posture for collaboration: The mindset and posture section of the Transition Design framework emphasizes the importance of taking up postures of openness, speculation (as opposed to certainty), to listening (as opposed to waiting to talk) and a willingness to change one’s mind. Successful collaboration within the context of this course also means that each team member must be committed to clear and timely communication (participating in discussions, answering emails in timely ways) and generally delivering on what you promised to do. Successful collaboration requires an awareness of team dynamics and asking (on an ongoing basis): Am I carrying my weight? Am I participating fully in discussions? If I have a problem with something or someone, am I dealing with it in a timely and authentic way (vs. ‘stewing’ on it)? Am I dominating conversations or trying to force my opinions and agenda on the group? Am I moving in ways that would make the other team members want to collaborate with me again? If not—why? Developing the skills for successful collaboration is one of the most important aspects of Transition Design and for this reason you will be asked to rate your team members at the conclusion of each assignment and again overall at the end of the semester. Collaboration is always messy and requires more effort than working alone. But we believe it is worth it because what we are able to achieve in concert with others is almost always greater than what we would be able to achieve on our own. Please put as much thought and energy into the collaborative process as you will your readings and discussion. The importance of delegation: On some assignments it will be important to delegate tasks within the teams. For instance, on Assignments #1a and 1b, we suggest the team conducts research individually and shares it via an online platform such as Evernote. The group should meet to discuss and analyze the findings and begin building the wicked problem map which will require the full range of perspectives represented in the group. Once all of the issues have been mapped and the group has identified and analyzed the ‘web of relationships/interactions’ that connect the nodes of the problem we suggest delegating tasks. Some members of the group might be charged with exploring a visual vocabulary that communicates the teams’ analysis and conclusions, while other members begin to map the various stakeholder groups affected by the problem (there are boxes for listing stakeholder groups at the bottom of the wicked problem map). Another group might begin to speculate on which three stakeholder groups have the most problematic relations (#1b) and present their findings to the group for approval to proceed. The success of working in a group on assignments such as these is dependent upon knowing when to work together and when to divide into small groups in order to work more swiftly and efficiently. At the beginning of each assignment, the group should discuss this and also consult with instructors about the best course of action if they are unsure. Write in complete and short sentences. One of the biggest pitfalls is noting a single word or ‘cryptic’ phrase on a post-it–you know what it means, but no one else does. Print–don’t write. Most people’s handwriting is NOT legible. Print clearly and and fill the post-it. All capitals works best. Pretend in this one case that you’re an architect. Think before you write. Think about how you will phrase your thought. Will others be able to understand the point you are capturing on your post-it if they come to the project canvas without any background/backstory. Say it simple and say it clear. If you observe these simple guidelines when undertaking a post-it exercise you will create an artifact that can stand alone as a piece of clear communication. Moreover, it can be photographed and used in your Medium site to communicate your thinking. 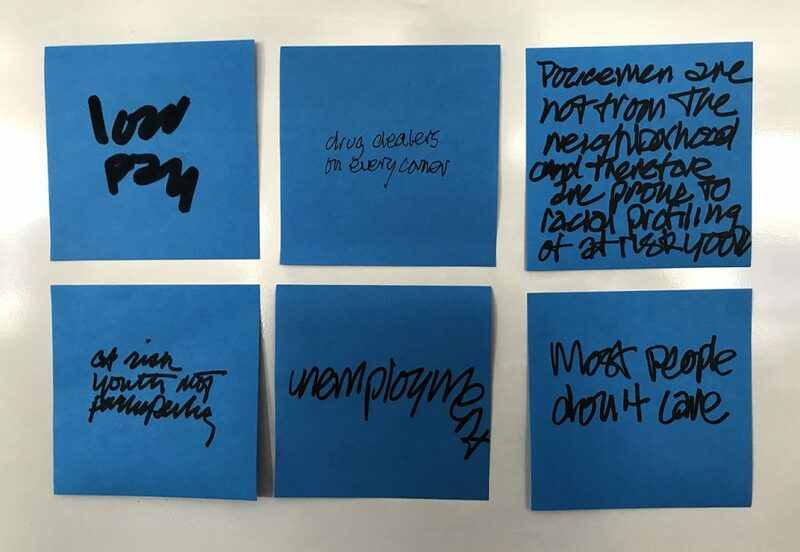 We’ve provided examples below on post-its from an exercise mapping the wicked problem of crime. The blue post-it notes show what NOT to do: they are difficult to read and cannot be understood by an external audience. The orange post-it notes can—use the orange ones as your guide. Light/bright colors, short, clear phrases or sentences, large printing! Assignments #1a and 1b are assigned on January 30 and are due as Medium posts on Feb. 11th. Information on Assignment #1a is found on this page, and 1b on the following page/tab. In Assignment #1a, teams will reference their research on a Pittsburgh-based wicked problem and begin visually ‘mapping’ it within 5 categories: 1) social issues; 2) environmental issues; 3) economic issues; 4) political issues; 5) infrastructural/technology issues. Each team will be provided with a paper-based, ‘project canvas’ with the five categories listed and will begin by populating these areas with post-it notes that clearly identify myriad issues (1 issue per post-it). Please refer to the guidelines for post-it notes at the bottom of the About the Assignments page. The Wicked Problem Map and Stakeholder Relations Map (assignments 1a & 1b) will be presented in a class critique on 2.6 for feedback. Both assignments will be due as Medium posts on 2.11.19. Teams should photograph the completed wicked problem map at high resolution (along with photos that document the process) for the medium post. Note: it is imperative that the final problem map submitted on Medium be high resolution and the project canvas (with the problem name and all names of the team members noted) should be turned into the Design Office in order for instructors to adequately review it. Please test the post to ensure it is readable, or points will be taken off the final grade. Distinguishing roots from consequences in wicked problems: as you map the problem, keep in mind that large, complex problems ramify up and down systems levels. At the level of our everyday lives, we often experience the consequences of wicked problems, as opposed to the root causes. As an example, consider the wicked problem of Crime in Pittsburgh. At the scale of an individual’s everyday life, the problem might manifest as muggings and break-ins in their neighborhood. We would argue however, that this is a consequence of the wicked problem. In order to develop strategies with the greatest potential to address or even resolve crime, we need to look for the root causes of the wicked problem, which are usually found at higher systems levels. At the level of the city, research might reveal that other problems are contributing factors; such as unemployment, opioid addiction, and a high divorce rate (among many others). If we go up to the state or national levels, we might trace the roots of crime in Pittsburgh to the collapse of the housing market (loss of money/shelter), pharmaceutical companies’ relationship to the opioid epidemic, the escalating cost of higher education, lack of prisoner vocational programs, racism/racial profiling and Supreme Court rulings. The more adept we becoming at looking at the problem systemically, the more interconnections and interdependencies to other problems are revealed. Play with the idea of distinguishing root causes from consequences. There is not ‘right’ or ‘wrong’ answer but using this distinction aids in tracing problems up and down systems levels. It is extremely important that transition designers develop this ability to look up and down systems levels and see the interconnections among issues and consequences related to wicked problems. To return to the example of crime: If a team looked no farther than the immediate problem of break-ins and muggings in a specific Pittsburgh neighborhood (this is the traditional way that designers consider problems—within small and contained contexts), the type of solutions they would propose would likely be less effective than if they traced the problem up a system levels to the city. If traced up farther to the national level, it might connect to seemingly unrelated issues like bank bail-outs, the collapse of the housing market and divorce rates. When the interconnections and interdependencies between these problems at higher systems levels are revealed, it can seem overwhelming. But, it also opens up the possibility to design interventions that address multiple issues/problems simultaneously because the deeper, root causes are revealed. This is the objective of Transition Design. In this assignment, teams will be provided with a large, analog ‘project canvas’ which has been divided into 5 archetyptal problem categories: 1) Infrastructure/technology; 2) political; 3) economic; 4) environmental; 5) social. To begin, teams should reference the research conducted on their wicked problem and use post-it notes to initially populate the problem map. (Reference our caution about post-it notes on page 1 of this section prior to beginning the exercise). We recommend an initial brainstorming exercise in which you list one issue per post-it and put them on a wall in no particular order. Then, begin a clustering exercise and move them to the project canvas in the appropriate category. Note: sometimes it won’t be entirely clear which category an issue belongs to (note: it isn’t always clear, so this process can spark conversations that deepen a team’s understanding of the problem). In a second step, discuss the interconnections among issues on the problem map. Identifying these connections is a critical component of the assignment. Once you have identified as many issues as possible, and through discussion have deepened your team’s understanding of the interdependencies and interrelationships within the problem, you are ready to begin the final visual representation on your project canvas. Before removing post-its from the canvas, photograph them, then move them to a wall or large sheets of paper, maintaining their categories. In the second stage of the assignment (creating the final map) you will develop a visual vocabulary for representing your wicked problem. We suggest using markers (or another method such as collage w/print outs) directly on the canvas (using black sharpie markers in various weight, supplemented by thick colored highlighter pens works well). The issues you identified on post-it notes form the ‘nodes’ on the map. You might choose to further distinguish types of issues based upon degree of importance or distinguish between ‘root’ causes and consequences, etc. Think about establishing ‘hierarchies’ among the nodes with lighter or bolder type, differences in sizes, colors etc. Equally important is to develop a vocabulary for representing the number and type of connections between the issues. These notations might indicate direct or indirect relationships, lines of conflict or affinity, etc. Be sure to take progress photos as your map develops, including close-ups (hi-resolution) of the notation to include in your final Medium post. Your objective is not only to create a more accurate and multi-perspectival representation of a complex problem, but to also develop a distinct visual vocabulary or ‘notation system’ for representing the complexity found within a wicked problem. This visual representation should help to explain how interventions in one area of the ‘system’ (problem) have the potential to ramify throughout in often counter-intuitive ways. Note: Assignment #5 will ask teams to develop concepts for 3 interrelated, ‘designed’ interventions that have the greatest potential to shift the system/resolve the problem (see Donella Meadows article on leverage points for change). The problem map you develop in this assignment will provide the basis for Assignment #5. Why we are asking you to create an analog map: There are a variety of digital and cloud-based mind mapping tools available, such as MindMup and NovaMind. However, for our purposes, these tools are still relatively primitive, and focus on representing ‘nodes’ or ‘objects’ (the issues you identify in research) within a system rather than the connections between them. These tools are therefore inadequate for identifying the interdependent/interrelated interactions and relationship dynamics within in a system. Transition Design refers to these collectively as the ‘connective tissue’ within a social system or wicked problem. For this reason, we are asking teams to create the map using the analog project canvas so that notations about these interconnections can be made. The example below: The wicked problem map below was developed in MindMup and enhanced in InDesign (to compensate for the limited visualization abilities of MindMup). It represents the problem of the drought/water shortage in Ojai, California and was developed in a workshop with local stakeholders who mapped the problem using a project canvas and post-its. Later, the results were transferred to MindMup, which enabled further work to be done and connections to be drawn between issues. The limitations of this visual software are evident; it is difficult to understand the nature of the types of relationships between nodes in the map. To our knowledge there are no adequate software/tools available that represent the complexities of a wicked problem and its internal, relational dynamics. A tool is needed in which the importance of the connections and relationships between nodes can be visualized. We believe that the explorations undertaken by project teams in this class might result in ideas that could inform a new generation of digital problem mapping tool. Using a problem map on an actual project: It is important to emphasize that in an actual project (such as Ojai), a wicked problem map like this would be developed in a long-term, co-design process with multiple stakeholder groups and would be informed by extensive research. The problem map would be contantly updated and evolve as a visual representation of the changing problem, a community’s understanding of it and as a ‘map’ of where ongoing interventions can be situated. Assignment 1a introduces the approach to students in an abbreviated process informed by desktop research only and therefore will NOT be an accurate representation of the problem. 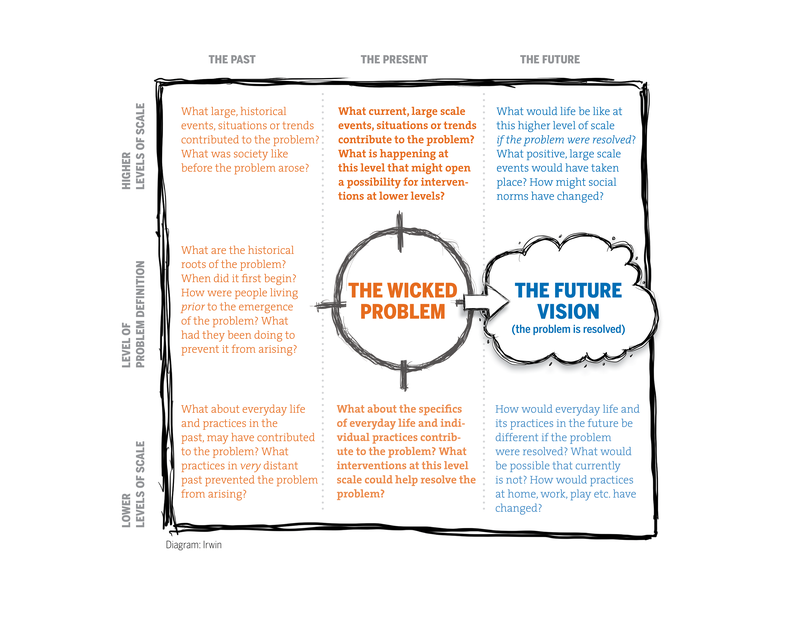 Download the Wicked Problem Map Canvas. Assignment #1b is given at the same time as 1a and both are due on 2.11.19. teams will undertake a process to: 1) identify all of the stakeholders affected by the wicked problem; 2) speculate on the conflicts and affinities among 3 stakeholder that would be barriers to problem resolution. This assignment and the Wicked Problem Map (assignments 1a & 1b) will be presented in a class critique on 2.6 for feedback. Both assignments will be due as Medium posts on 2.11.19. The Stakeholder Relations Map (like the Wicked Problem Map) should be completed in analog form. High quality visuals of the final map (and process shots where applicable) are required for the final Medium post. Why this is a hypothetical exercise: One of the main barriers to wicked problem resolution are multiple stakeholders with conflicting agendas. In many cases, different stakeholder groups cannot agree on what the problem even is, let alone agree on how to solve it. These different problem definitions are often underpinned by conflicting belief systems and value sets. Identifying areas of both conflict and affinity within stakeholder groups is essential to developing effective ‘interventions’ aimed at resolving wicked problems. Transition Design argues that the concerns and welfare of all of the stakeholder groups affected by the problem (including members of the ecosystem and the environment itself) must be considered when formulating solutions/interventions. These concerns can only be revealed through extensive, qualitative research (for example: field interviews, workshops, questionnaires, and even methods employed by peace-keeping missions in war-torn areas) which is not feasible within the short span of this semester-long course. The results of actual research would yield deep patterns and insights about stakeholder groups that could inform the design of systems interventions. This assignment is intended only to introduce the concept of stakeholder relations to students who will hypothesize (based upon desktop research and speculation) who the stakeholders are and what their concerns might be. The results of this assignment could, however, serve as a ‘sketch’ or proposal for conducting actual research. Step 1- Identifying Stakeholder Groups: The objective of this assignment is to identify as many stakeholder groups affected by the wicked problem as possible, including members of the ecosystem (for instance: birds, the local watershed, the land, etc.). Including non-human stakeholders in the Transition Design process draws from the work of Australian writer and activist John Seed who developed a ritual approach called The Council of All Beings, to illustrate the interconnectedness of life on the planet. Researching and mapping the wicked problem should help reveal the number of stakeholder groups that are affected. This research should also ‘hint’ at where there may be opposing agendas, belief systems and worldviews among different groups. First, teams should conduct a brainstorming session and list as many stakeholder groups as possible (listing one group per post-it). Arrange the post-its on a white board with ample room between them. Take time with this step and try to identify groups that might have been overlooked by traditional problem-solving approaches. Note: many traditional design approaches focus only on stakeholder groups with power or influence, whereas Transition Design looks at any stakeholder group that is affected by the problem and argues that uneven power dynamics and the disenfranchisement of certain stakeholder groups is a barrier to problem resolution and can even the root of complex problems. Step 2- Do Stakeholder Groups Agree/Disagree? After teams have identified as many groups as possible, choose the 3 stakeholder groups that are likely to have the greatest degree of disagreement or differences. For instance if the wicked problem were a city’s water shortage, three groups that might be at odds with each other might be a 5 star resort that relies on tourism, a lower income resident whose water is rationed by the city and a local, 3rd generation citrus farmer. The resort relies on wealthy tourists which owner argues helps support the local economy, however water is not rationed at the resort—tourists may use as much water as they like. The water shortage drives the price of water up, so the lower income resident is having to reduce water usage even while her water bill increases. She sees wealthy tourists coming to town who enjoy the benefit, but carry none of the responsibility/burden of the shortage. The citrus farmer was raised in the community and his ancestors have been farming the same way for generations. His crops use a lot of local water but he feels it is his right because he was there before the community grew. He feels that the tourists and the people mov-ing into the community are the problem–that’s the only reason there is a water shortage. Points of view like these begin to surface as you research the various parts of a complex problem. To begin, write the name of the problem in the middle of the triangle and the names of the 3 stakeholder groups in the boxes provided. Now, speculate about the general dispositions of the three groups and the relations among them. First look for areas of conflict and disagreement among the groups and label those in red. As in assign 1a, you are formulating a visual vocabulary for representing relations among stakeholders. Explore ways of labeling the lines of conflict and clearly representing the nature of conflict/disagreement (in some cases, your speculation of conflict might trigger additional research). Next begin to speculate on where there might be agreement or alignment of goals between the groups (or instance in the Ojai example, all three groups agree that maintaining Ojai’s unique culture is crucial). Draw these connections of affinity in green marker and label them. Speculating on where the biggest social barriers to resolutions are can help frame the ethnographic field research that will ground or refute the speculations detailed here. In your research you may also reveal important connections between groups that are ambiguous or ‘mixed’ in nature—connect them with black lines with a brief notation. A hypothetical exercise like this can serve as a starting point in an actual project and can point the way to more in-depth field/ethnographic research. Teams should also feel free to annotate the ‘Relationship Triad’ with notes about questions, where further research would be necessary, etc. Teams should also speculate in their Medium post about how the lines of conflict could be barriers to problem resolution and conversely, should also consider how lines of agreement or affinity could be leveraged in designing interventions. Assignment 1a & 1b Presentations: The class on Feb. 6th will be devoted to group presentations of both assignments, followed by a class discussion. Teams will be asked to present their wicked problem and stakeholder relations maps in analog form using the project canvases provided. Presentations should be 10 minutes or less and may be supplemented with a digital presentation. The presentations should explain the process, articulate the primary characteristics of the problem, discuss 2-3 interconnections/interdependencies that were revealed on the wicked problem map, briefly describe the speculation on stakholder conflicts/alignment and speculate on how the results of the two assignments might guide field research. Teams should also report on difficulties, challenges and any surprising conclusions or ‘clues’ that the assignments revealed. Both assignments should be submitted as a Medium post by 2.11.19. Make sure that the process is documented visually with high-quality photos. Remember to write the Medium post so that it can be viewed by an outside audience who will not only learn about the problem and its stakeholders, but also the emerging approach itself. What is working, what could be improved? If you had the time and budget for research, what would you undertake first? The examples below show different ways of thinking about and visualizing stakeholder relations. These examples are different from the project canvases you have been provided and are simply meant to show there are multiple approaches to mapping and analyzing stakeholder relations. Refer also the the Stakeholder Relations page in Additional Resources. Download the Mapping Stakeholder Relations Project Canvas. In Assignment #2, teams will use a project canvas to map the socio-technical transition that forms the context for their wicked problem. Using a project canvas with the Multi-Level Perspective tool (MLP), teams will look at the anatomy and dynamics that form the large, historical context for the wicked problem. Teams will begin brainstorming with post-its (as with assignments 1a and 1b) but will later translate the ideas with marker or other media onto the canvas. Please refer to the guidelines for post-it notes on the About the Assignments page. This assignment will be due as a Medium post 3.19.18. High quality visuals of the process as well as the final MLP should supplement the final Medium post. Becoming familiar with the MLP: to begin, the group should discuss the MLP and refer to the Geels article (2005) that documents the historical socio-technical transition from horse-drawn carriage to automobile (see diagram below). The MLP distinguishes between three systems levels; The Landscape (large and slow moving social/economic/political/cultural/environmental events); The Regime (networks, groups and institutions and/or infrastructure that can become ‘entrenched’); and The Niche (small, informal ‘protected’ spaces where innovations can be developed, risks taken and norms challenged). Socio-technical systems have similar anatomy and dynamics as wicked problems, that include: beliefs and norms, designed artifacts & communications, large infrastructural systems and all manner of practices and behaviors. Donella Meadows’ article “Places to intervene in a System” can be a useful guide for thinking about which factors are likely to trigger the most significant systems-level change. An initial discussion is a good way for the group to ‘play’ with the MLP and practice thinking between systems levels to see their interconnections and non-linear dynamics. Situating the wicked problem within the MLP: Using the Geels diagram as a guide, develop a visual map that situates the wicked problem within a socio-technical (MLP) context. Begin by working with post-its on the MLP project canvas to map answers to questions such as: What are historic and current factors at the landscape and/or regime levels that are creating/exacerbating the problem? What are the factors at the regime level that might be barriers to solutions proposed at the niche level? In what ways has the regime become ‘stuck’ or ‘entrenched’? What are the barriers to new ‘transition pathways’? Note that the Geels diagram maps an historical transition in hindsight. Assignment 2 challenges students to understand the historic origins of the problem up to the present in order to propose strategic interventions aimed at transitioning the entire system toward a more sustainable future. For example: the wicked problem of Ojai’s water shortage is connected to climate change, a condition that exists at the landscape level. The problem also exists at the regime level in a number of ways including ‘entrenched’ cultural norms/practices/behaviors (attitudes about water use, hygiene, aesthetics connected to gardens etc.) and an inefficient and outdated water infrastructure (that results in loss of fresh water and inefficient irrigation and purification technologies). Recent extreme events related to climate change at the landscape level (The Thomas fire, the Montecito mudslide etc.) opened up possibilities at the niche level for new initiatives such as Transition Design to be incubated in the hope of disturbing/destabilizing entrenched and unsustainable systems at the regime level. Other niche experiments include initiatives (interventions) such as new technologies aimed at water purification and a new openness to legislation taxing water use). We say ‘opened opportunities’ because Ojai’s invitation to Transition Designers or new water saving technologies did not/could not gain traction until climate change led to the critical lack of water that could not be solved within the existing regime structure. Each team should attempt to map the various technologies, infrastructural systems, businesses, practices and services and ‘norms’ that are connected to the wicked problem from a socio-technical point of view. Ask where and how large systems are stuck and where attitudes, mindsets, values (landscape) contribute to the problem as well as practices and behaviors (regime). Pay particular attention to where barriers lie or where what the socio-technical researchers refer to as ‘path dependence’ may exist, because these are often points of opportunity for seeding systems-level change. Identifying points for systems interventions: Once the team has developed a good visual overview of the problem within the socio-technical system context (resembling the Geels diagram), begin to identify ‘leverage points’ within the system where proposed solutions would have the greatest potential for change — solving for the problem (we say solving for the problem because their is no single solution that will solve it). It might be easiest to begin at the level of the niche. What new projects or solutions could be proposed, protected and developed at the regime level? Do they address stakeholder concerns/hopes? What is occurring at the landscape and regime level that would enable or prohibit these proposed solutions? Is it possible to introduce interventions at all three levels simultaneously that reinforce each other (feedback) to impact the problem more significantly? What are existing projects, solutions, policies, norms etc. that can be leveraged for greater impact? (sometimes projects that may seem unrelated, when linked, can become powerful collective leverage points for change). Within this context, ‘leverage’ might mean connecting new and existing solutions, amplifying some, or in other cases, ‘dampening’ or eliminating them altogether. Remember Meadows’ concept of positive and negative feedback loops and the ways in which they can drive change within a system. At this stage, simply discuss what ‘types’ of projects might help address the problem and note them on the diagram as well as existing projects and initiatives related to the problem. Existing and potential solutions will likely exist at all three levels within the socio-technical system and will involve action in many areas (economic, technological, political, infrastructural and social; i.e. changing mindsets, cultural norms and everyday practices). Once existing and proposed solutions are indicated on the diagram, the group should discuss which of these have the potential to trigger the greatest degree of change in the system and how they might be connected for greater leverage. For instance, conceiving a new policy aimed at water conservation could be reinforced by projects aimed at educating citizens about water use and providing them with information and initiatives that encourage them to change their mindsets about water use and support behaviors aimed at conserving water. Try to identify as many intervention points as possible in the system and identify what type of solution would best be situated there. The speculation on where intervention points for change are and what form the interventions will take is preparation for Assignment #5, Designing Interventions. Both the Wicked Problem Mapping and Multi-Level Perspective Mapping inform this last assignment. How transition design resembles acupuncture: Conceiving solutions within large socio-technical systems can be likened to the work of an acupuncturist who first examines the human body in order to understand where the dissonance/disease lies, and then strategically places needles along certain meridians to ‘nudge’ the system back into health. The acupuncturist’s understanding the of whole system and its interconnections and energy dynamics (the meridians) enables him/her to place the needles for the greatest impact. The final MLP canvas: The final result of this assignment should be a project canvas that resembles the Geels diagram but that has a past, present and near future in which possible points of intervention have been identified and high-level concepts for interventions discussed. The objective of this assignment is to provide teams with a deep understanding of the large context within which their wicked problem arose and the ability to ‘read’ systems dynamics in order to seed and catalyze change within a system. Assignment #4, The Spatio-Temporal Matrix will provide a further opportunity to look at the problem within a radically large context. 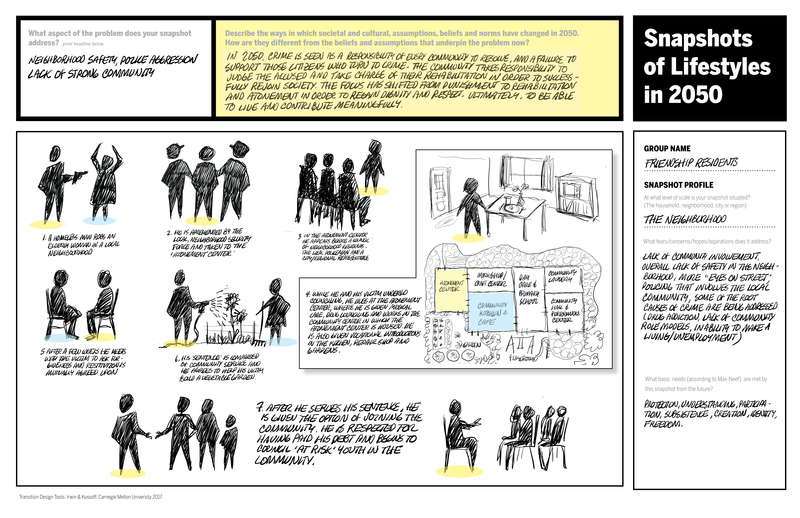 Documenting the process: an important part of a transition designer’s role is to develop effective ways of visualizing the complexity of wicked problems and their spatio-temporal contexts. 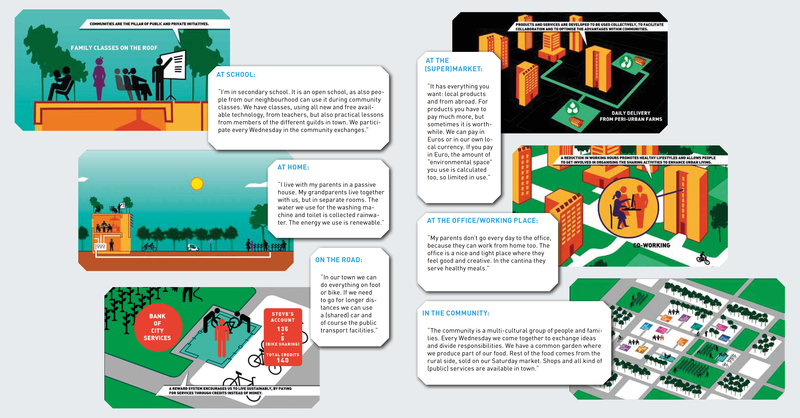 These visualizations can serve to both coordinate action and guide strategy. Teams should document each phase of their process, most of which should be undertaken together in order to develop a ‘transition narrative’ about their problem—this can only happen in discussion in which multiple perspectives and research conducted individually is brought together. 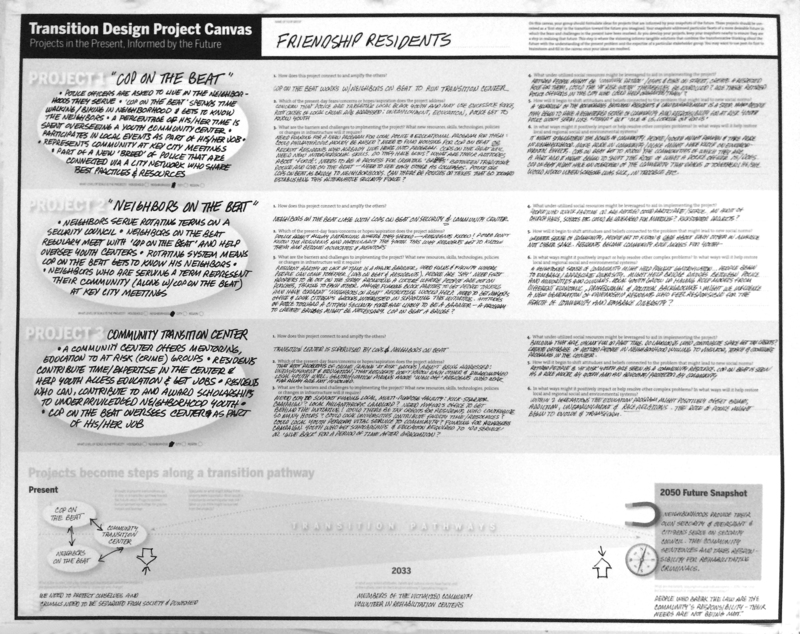 Teams can use the analog project canvas or a digital translation of it for their final submission. The final MLP map and Medium post should show/address: 1) historical contributing factor to the wicked problem at all three levels; 2) proposed sites and concepts for intervention; 3) description of the process; 4) brief discussion on the difficulties, insights gained and how this compares with traditional design process. As with the previous assignments, teams should document the process photographically in hi-resolution and submit via a medium post. Check to ensure that ALL details/text on your MLP is legible in the medium post. Submit a hi-resolution photo of your MLP to the TA. An important note: In actual practice, Transition Design will be slow, patient work that requires careful observation followed by a period of waiting and observation after an intervention is undertaken. For this reason, Transition Design projects will likely span many years or even decades. This assignment introduces a process and it will not be possible to do more than speculate on the questions posed. The Transition Design process would always be informed by extensive research. In Assignment #3, teams will use a ‘narrative template’ to develop a 2050 day-in-the-life vision of a place-based, lifestyle in which the wicked problem has been resolved. Teams should refer to Porritt’s book The World We Made and the SPREAD EU Sustainable Lifestyles Roadmap and Action Plan 2050 for examples of how to develop future-oriented, lifestyle-based narratives. This assignment will require the formulation of both visual and verbal narratives. A simple guide for diagraming human figures can be downloaded as a PDF at the bottom of this page. This assignment will be due as a Medium post 4.24.19. High quality visuals of the process should supplement the final Medium post. As with the previous assignments, teams will develop the vision in analog form on the project canvas and photograph it in hi-resolution for submission in the Medium Post. How to Develop a Lifestyle Based Vision: This assignment builds on the concepts from previous classes in formulating vision. In their storyboard/canvas, teams should address how these factors may have contributed to the resolution of the wicked problem in the future: large events (cultural, environmental, technological), changing social/cultural norms and beliefs, changes in the ways in which individuals and communities satisfy their needs, reintegration of place-based wisdom and ways of life, changes in practices and behaviors, systems dynamics (within social and socio-technical systems) and the recent phenomenon of a globally interconnected world. Day in the life scenarios are powerful because they provide a way to describe solutions in a more compelling, narrative form. Tell us a story about life in the future in which your wicked problem no longer exists. Transition Design argues that a powerful way for stakeholders to transcend their differences in the present is to co-create visions of a future they agree upon. Backcasting from this future to the present creates a ‘transition pathway’ along which ‘interventions’ serve as steps toward that desired future. This assignment aims to introduce long-term visioning as part of the Transition Design approach. Begin with Envisioning New Beliefs and Paradigms: Teams should begin by imagining (and capturing via post-it notes), how beliefs and assumptions might have have changed by 2050, if the problem had been resolved. Beliefs and assumptions often lie at the root of wicked problems, so in order to develop solutions that transcend existing paradigms, teams should discuss how current beliefs, cultural norms and assumptions have contributed to the wicked problem. Then, speculate on what a 180 degree shift in those beliefs would look like in 2050. If community attitudes about water in 2019 are characterized in statements like: “we believe water is a commodity that can be bought and sold” and/or “there will always be enough water” and “some people are more deserving of enough water than others” and “humans are more deserving of enough water than other species,” then by 2050, if the water shortage had been resolved, the new beliefs might include: “water is sacred—it is life and should never be wasted”, “water is part of The Commons and all species have an inalienable right to it”, “water is precious and should be conserved and honored.” Once a new worldview is articulated in a future vision, it is easier to develop day-in-the-life scenarios that describe solutions that are informed by: new technologies, new practices and behaviors, new cultural norms and the recovery of place-based wisdom and new value sets. An example of a visual/verbal future narrative using the template provided is shown below using neighborhood crime as the wicked problem. Thinking about and articulating radical changes in attitudes is a powerful way to transcend existing paradigms and entrenched ways of thinking about problems and solutions. Play with radical ideas and don’t shy away from what might seem like unrealistic, ‘utopian’ visions. The point is to imagine “what if” and not worry about ‘how,’ in order to transcend our habitual ways of thinking and ‘solutioning’. Remember: you are articulating a new belief system that has led to the resolution of the problem. Integrating Stakeholder Concerns into Future Visions: Once your group has articulated new beliefs and assumptions about the problem itself, refer back to your discussions about stakeholder relations and revisit some of the areas of conflict as well as alignment. These are relevant in developing your 2050 ‘snapshot’ in considering how these areas of conflict might have been resolved. What would everyday life look like if stakeholder fears/concerns or hopes/aspirations were resolved? What would they be able to do that isn’t possible now? How would stakeholders’ quality of life improve? How would it affect what life in the household/the family? With neighbors? At work and play? How would the resolution of these fears/concerns improve interactions with others and the ability to satisfy individual and family’s needs? What does this future look/sound/smell like? What role does the environment play in this future snapshot? Can the hopes/aspirations of the previous stakeholder exercise inform the vision in the same way? Finally, refer to the list of Manfred Max-Neef’s basic needs and list how many needs are satisfied simultaneously by your solution/snapshot. Developing the 2050 Vision: The project canvas provides you with a structure or storyboard template within which to develop a visual/verbal narrative vision. We recommend working first with post-its that represent ‘facets’ of the emerging narrative vision. Teams may want to develop several visions using post-its before deciding upon one to develop in the template provided. Refer to the instructions on how to draw figures to aid in ‘storyboarding’ the vision and refer to the example below. Try to draw aspects of your future vision and supplement it with words. Remember—teams are designing and articulating solutions, through a description of everyday life! This approach is intended to transcend our dominant, reductionist paradigm that thinks in terms of fragmented and unrelated solutions or categories such as ‘economic solutions’, ‘educational solutions’; you may have ideas about how an educational solution was implemented that led to the future you now envision, but it should be apparent via the day-in-the-life narrative you develop. All solutions are experienced through the holistic space of everyday life. Envisioning new solutions through this lens gives rise to more integrated and sustainable approaches. The overarching objective of this assignment is to describe an aspect of a future that you and others can get excited about by thinking beyond our current paradigms and practices. Don’t worry about the barriers, just imagine possibilities! Download the 2050 Future Vision template here. In Assignment #4, teams will work with The Spatio-Temporal Matrix, a tool related to the MLP that is useful in situating wicked problems and future visions within radically large, spatio-temporal contexts. Teams will be provided with a project canvas and can begin the assignment in the usual way with a brainstorm session/post-it notes that respond to questions posed in each section of the 9-square matrix. Teams should complete the assignment as before, working with either marker (make sure printing is clear and well written) or print-outs pasted onto the project canvas. This assignment and the final assignment #5, will be due as Medium posts 5.8.19. As before, photograph the process and document the final canvas with a hi-resolution image posted to Medium. About the Spatio-Temporal Matrix: The matrix has been developed to situate wicked problems in larger than traditional contexts that span systems levels. This process reveals interconnections and consequences between higher and lower levels and considers the historical roots of the problem (at multiple levels of scale). The last column of the matrix provides the opportunity to further articulate the future vision at both higher and lower systems levels. Most design-led approaches situate problems within small, easy to manage contexts and problem frames whose objective is the realization of swift, profitable solutions. Transition Design argues that wicked problem resolution requires myriad interventions at multiple levels within extremely large spatio-temporal contexts. Wicked problems exist at multiple levels of scale and always have their roots in the past because it takes years, decades, or even longer for problems to become wicked. It is necessary to look at both higher and lower systems levels to understand the problem’s ramifications and consequences in the present, as well as look to the past to understand the problem’s root causes and evolution. In essence, involves looking up and down systems levels in space, and backward and forward in time in order to contextualize and address the wicked problem framed in Assignment #1a—both dimensions play a role in devising interventions. Delineating and investigating large systems contexts is what distinguishes the Transition Design process and makes it possible to 1) understand the present-day ramifications and consequences of wicked problems (looking up and down systems levels); 2) understand how wicked problems evolved and identify their root causes (in the past); and 3) intentionally transition the system toward preferred futures over multiple time horizons. Why this Assignment is Hypothetical: Like stakeholder relations, the Spatio-Temporal Matrix would be used as a guide for conducting long-term, in-depth research (both field research and desktop research). This assignment is intended to introduce the concept and approach to students and acquaint them with the tool which can guide research. The results of this assignment could serve as a ‘sketch’ for conducting research that would validate or refute this speculative work. Beginning the Assignment: For this assignment, teams will draw extensively on the research already conducted on their wicked problem, however it is likely that additional, historical research will be needed to supplement it. The assignment also calls for the future vision (situated at the mezzo level) to be expanded to higher systems levels (the macro) and lower systems levels (the micro). Within each area of the Matrix, several questions are posed that should be answered through research and speculation. Teams should begin by conducting a brainstorm with post-its applied to the project canvas and answer as many of the questions as possible based upon what they already know (one idea per post-it). This assignment is not meant to be an exhaustive exercise; it will be sufficient to formulate 3-4 responses for each question with the objective of discovering new and relevant information about the problem context that previous assignments and research had not revealed. Note: on an actual project the timeline for conducting research such as this would be months and updates, ongoing. Completing the Assignment: Teams may execute the assignment by simply filling in each box of the matrix with text on the project canvas. The final Medium post should include a process description, outline learnings/insights and speculation about how the tool might be developed further and how it compares to more traditional design approaches. Download the Spatio-Temporal Matrix Project Canvas. In Assignment #5, teams will use a project canvas to develop concepts for 2-3 systems interventions (projects/initiatives) aimed at resolving their wicked problems. These propositions should be informed by the research and previous assignments. This assignment should be completed in text form by filling in the project canvas template (have the team member with the best printing complete the assignment! Teams are free to develop supplemental materials (visuals, diagrams, mood boards etc.) which will be considered for extra credit. This assignment will be due as a Medium post 5.8.19. High quality visuals of the process should supplement the final Medium post. Designing ‘Systems Interventions’ as Opposed to One-Off Solutions: Transition Design is design for long horizons of time; dozens of years or even dozens of decades as the wicked problem/system/society transitions toward resolution and more sustainable futures. What traditional design approaches would see as ‘solutions’ or one-off ‘projects’ or ‘initiatives’ are instead seen as ‘interventions’ in large systems, designed to intentionally shift the trajectory over time. 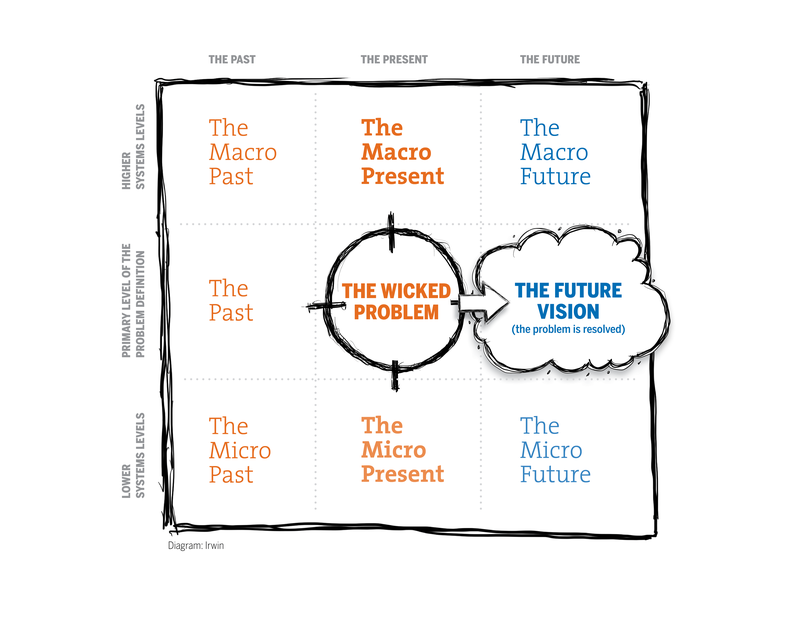 In order to situate these designed interventions at points within the system with the greatest potential to shift it, designers must have an understanding of the whole system, which includes the past and future visions (as demonstrated in the the wicked problem map, MLP and Spatio-Temporal Matrix). These interventions are: 1) situated at multiple levels of scale and over multiple time horizons; 2) take many forms with many objectives (new technology/infrastructure, new narratives, changes in cultural norms, belief systems, practices and behaviors etc. ); 3) amplify grassroots efforts already underway; 4) connect to each other to form ‘ecologies’ of interventions for greater traction and potential to shift the system; 5) can involve many types of traditionally designed projects and initiatives (such as communication design, product design, service design or social innovation projects). Results, outputs and learning from these interventions always triggers a new futuring process in which the vision is updated and a new round of backcasting creates an updated transition pathway. Beginning the Assignment/Using the Project Canvas: The project canvas provides a template aimed to guide teams through the process of conceiving 2-3 systems interventions. Like Assignment 5, it can be completed in text form but supplemental visual/diagrammatic information will be considered for extra credit. After thoroughly reviewing the template, teams should begin with a brainstorming post-it exercise on white boards to identify as many potential ‘points of intervention’ as possible. Like the acupuncturist, teams should look for areas with the potential to spark the biggest change/shift the system toward a more sustainable future (problem resolution). For the purposes of this assignment, teams can build upon projects that already exist but must articulate how they need to be adjusted, supplemented or redesigned to become a Transition Design solution and part of an ecology of interventions. Teams may also want to refer to the MLP diagram to discuss what opportunities exist at the 3 levels for designing/placing interventions. After brainstorming ideas for interventions, do a clustering exercise and evaluate the options in terms of level of scale at which they would be placed, time duration of the project and their complementarity to one another. Note: ideally, concepts for interventions should be a different levels of scale and different time horizons or durations. Completing the Assignment: Once the team has identified 3 interventions, they can begin articulating the intervention on the project canvas and answering the questions about each project. Remember that this assignment represents the culmination of the concepts and principles previously discussed so keep a record of the team conversations and plan to supplement the project canvas in the team’s Medium post. Reflect upon how the ecology of interventions would begin to shift things in the system and speculate on what actions might follow. Make sure that a team member with clear handwriting fills it out and refer to the page on Post-It note usage for guidelines on how to make a clear and legible artifact. Download the Transition Design Project Canvas.